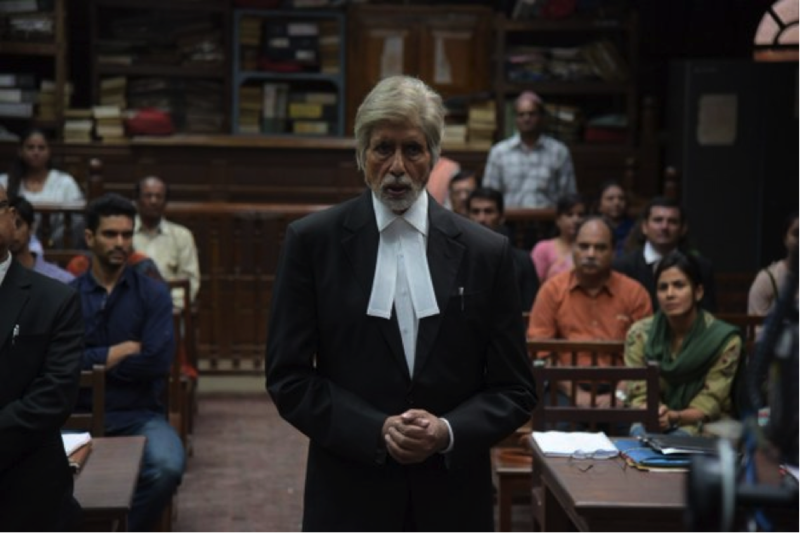 It won’t be a misnomer to call Shoojit Sarcar’s Pink, as the movie of the year! We are aware that Karan Johar’s Ae Dil Hai Mushkil and Aamir’s Dangal are still to go off the mark! And for sure, your opinions can differ from ours at Trend Mantra. But that said, may we also confess that Pink is one of those movies that does the job for reviewers for you don’t need convincing from us to push you from that lazyboy sofa or what you may be slouching on to go out there and be arrested for over two hours, packed in the theater! Don’t outrage the modesty of a woman! The protagonist of this movie, unlike most other flicks isn’t a man or a woman. It is an issue. A crime so gory, a daring so boldly murky and an attempt so cowardly and one that manages often a scot-free existence in an India still marred by absence of justice, that it becomes impossible to avoid it, therefore one has to address the elephant in the room(read assault on women’s dignity in India). 3 men, after a casual night of rock concert cajole 3 women in Delhi- played with a brutal authenticity by Kirti Kulhari (Falak), Andrea Taring(Andrea) and Taapsee Pannu (Meenal)- into having dinner and drinks with them in a night of casual and harmless mingling, which is just the facade. Unbeknownst to the girls, the men with hideous intentions come to make indecent physical advances and in a matter of utter instinct, Meenal smashes Rajveer (the main baddie played with a clarity by Angad Bedi) with a beer bottle finding herself defenseless, having failed to convince the boy to relent despite repetitive attempts. Panicky and not knowing how to react, the girls evade the scene where the baddie tagged with his foul companions decide to pursue the girls thereafter, after subsequent talks to make girls apologize to the main miscreant fail to materialize. The girls, determined to protect their self-esteem and pride won’t relent and the boys, to prod their machismo and unworthy manliness won’t back out from ruining the trio’s lives, even if that means spreading around vile rumors of the girls being prostitutes and habitual fraudsters who scheme rich blokes for money in the very neighborhood where the girls have been living with peace. Using politically backed connections and a false FIR claiming the girls to have made unruly advances (while only the opposite is true), toward boys; also citing attempt to murder as the main charge against Meenal sees the women being harassed by cops, with the wrong ‘offender’ being put behind bars. The boys at this time think they’ve ‘won’ the ego war and that’s when Mr. Amitabh Bachchan, who at this point of time was a silent witness watching the nervy and listless girls from the sidelines (staying in the same neighborhood as girls)- enters as the unlikely rescuer. Life couldn’t be any more hopeless for retired advocate Deepak Sehgal- visibly a man marred by his jaded past, one epitomized by a falling mental health and a wife on the verge of death. But there is a brooding lawyer still alive in this complex character who emotes a haunting silence through his deeply melancholic and troubled eyes. The audience, within minutes of seeing Mr. Bachchan’s character cross path with the falsely implicated can fathom the burning urgency in this gentleman who is watching helplessly and worryingly the plight of the clueless girls whose dignity thus far has already been thrashed like a lamb led to slaughter. Through exceedingly brilliant dialogue writing that is as befitting to the movie as it is pacifying for the audience that watches patiently and ever so grossed for justice to be served, the scenes shift maniacally from roadside monologues and teary eyed jerks to courtroom- intensity with a fluidity that you could only expect from the brilliance of someone like Shoojit Sarcar. Trend Mantra wishes to state that in calling advocate Sehgal a complex character is by no means a remark on his personality rather the brilliantly evocative paradigm shift of his on-screen avatar that shifts from being a seemingly helpless old man, well beyond his prime to being a legal eagle who subtly attacks the prosecution with a cunning and daring that one would expect only from a pro. Remember those times when ‘Baywatch’ would be on TV and the moment our elders would enter the room, we would be swift enough to swipe the channel? After all, it is no surprise that the three letter word which is as regular in the rest of the world as say dandruff or sale, is a strict taboo to be verbally pronounced in public light in India. Our culture has called for such a ‘decorum’. 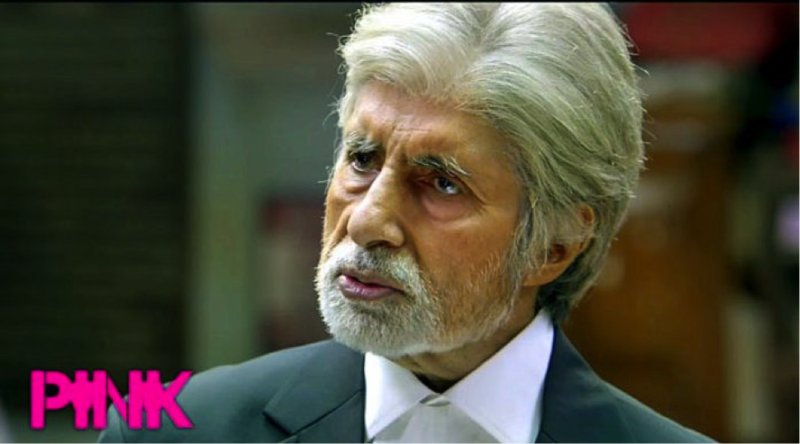 Amitabh Bachchan tears apart this needless humdrum under the glare of bare public eye as his on screen character intentionally attempts to dissect Meenal’s ‘character’ who is fighting the war of her life being labeled by the prosecution, ‘a woman of questionable character’. The reason is simple- he strips down those questioning men to the last moral sign of their dignity in order to give them a taste of their own medicine. 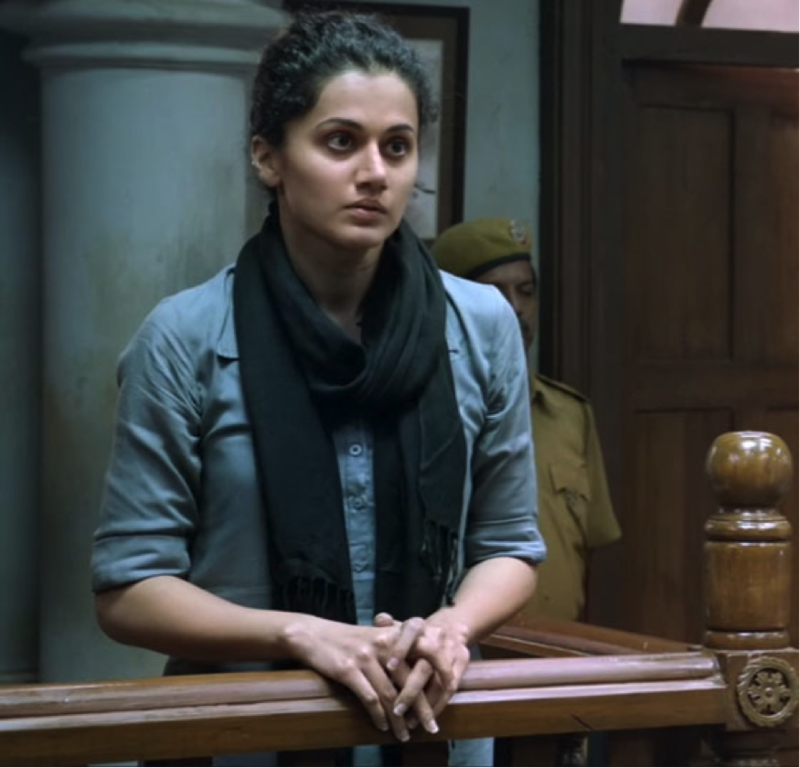 In doing so, he exults from his defendant (Taapsee) a screaming and teary eyed monologue in front of “his highness” where she confesses that she wouldn’t back out from smashing the head of the foul guy again if her dignity would come under assault in future. And as you witness the ‘scantily dressed emotional saga’ in courtroom, you can’t help but wonder, that how can men, so effortlessly become beasts that women can only loathe and despise and get away scot-free, having powers that can ‘buy’ justice into believing what is painted as an obnoxious lie! And that is also where you feel much relieved and joyful that in men like Advocate Sehgal (Mr. Bachchan) hope isn’t lost. That against the tyranny of misinformed judgment and blazon molestation of a woman’s dignity, there are heroes who live among us and therefore must be celebrated. 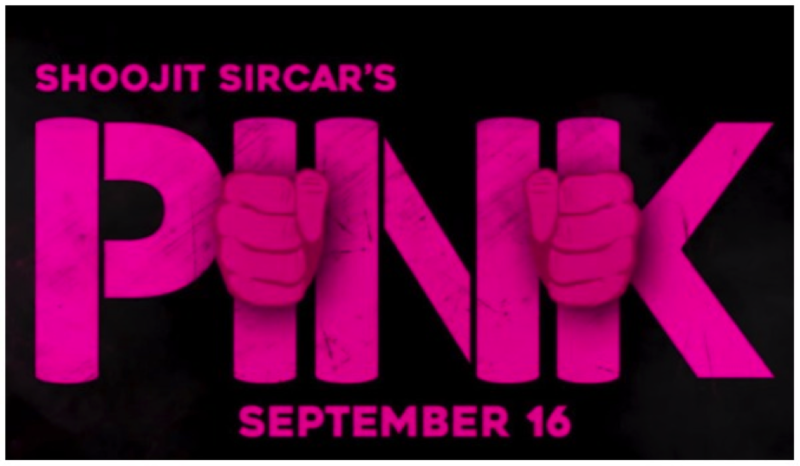 If not for anything else, watch Pink for it may just be the moral obligation that you may do well to pay back to the society and for its precious jewels- our women!